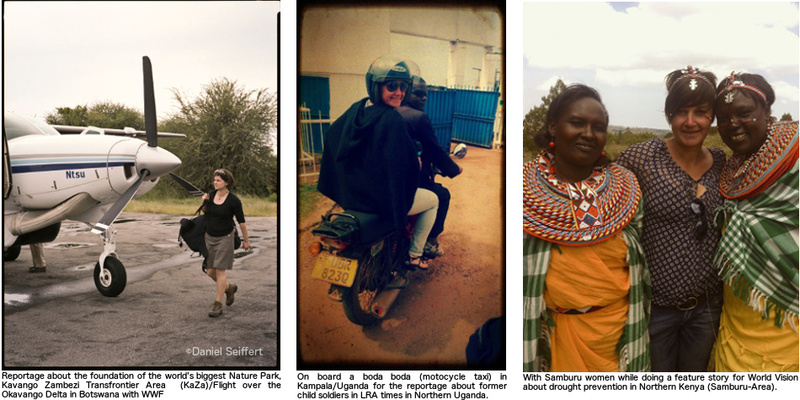 I am a documentary journalist currently based in Nairobi, Kenya and Hamburg, Germany with over 13 years of experience working with major magazines, newspapers and NGO´s (Non-Governmental Organizations) on topics from all over the world. My primary focus area covers african issues and projects of interest to my clients. Themes covered include nature, developmental programmes, health, medicine and social aspects. My educational background is nature science and biology, having studied at the Universities of Bielefeld and Hamburg with a focus on ecology, animal behaviour and primatology. My fieldwork led me to the tropics of Uganda, Panama, Costa Rica and Columbia, where I carried out research on interactions between animals and their environment. Nowadays I write and work as a freelance journalist and editor for german magazines like GEO, stern, ZEIT among others. Other assignments include press work for World Vision, WWF, Greenpeace, DAAD, KfW and BMZ.